Lee was born on February 6 1732 [O.S. 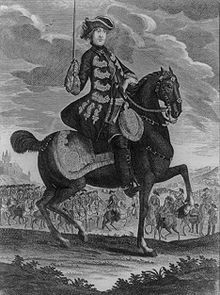 January 26, 1731] in Darnhall, Cheshire, England, the son of Major General John Lee [note 1] and his wife Isabella Bunbury (daughter of Sir Henry Bunbury, 3rd Baronet). He was sent to King Edward VI School, Bury St Edmunds, a free grammar school, and later to Switzerland, where he became proficient in several languages, including Latin, Greek, and French. His father was colonel of the 55th Foot (later renumbered the 44th) when he purchased a commission on April 9, 1747 for Charles as an ensign in the same regiment. After completing his schooling, Lee reported for duty with his regiment in Ireland. Shortly after his father's death, on May 2, 1751 he received (or purchased) a Lieutenant's commission in the 44th. He was sent with the regiment to North America in 1754 for service in the French and Indian War under Major General Edward Braddock, in what was a front for the Seven Years War between Britain and France. He was with Braddock at his defeat at the Battle of the Monongahela in 1755. During this time in America, Lee married the daughter of a Mohawk chief. His wife (name unknown) gave birth to twins. Lee was known to the Mohawk, who were allies of the English, as Ounewaterika or "Boiling Water". On June 11, 1756 Lee purchased a Captain's commission in the 44th for the sum of £900. The following year he took part in an expedition against the French fortress of Louisbourg, and on July 1, 1758 he was wounded in a failed assault on Fort Ticonderoga. He was sent to Long Island to recuperate. A surgeon whom he had earlier rebuked and thrashed attacked him. After recovering, Lee took part in the capture of Fort Niagara in 1759 and Montreal in 1760. This brought the war in the North American theater to an end by completing the Conquest of Canada. Lee went back to Europe, transferred to the 103rd Foot as a major, and served as a lieutenant colonel in the Portuguese army. He fought against the Spanish during their unsuccessful invasion of the country, and distinguished himself under John Burgoyne at the Battle of Vila Velha. He returned to England in 1763 following the Peace of Paris, which ended the Seven Years' War. His regiment was disbanded and he was retired on half pay as a major. In May 1772, although still inactive, he was promoted to lieutenant colonel. In 1765 Lee fought in Poland, serving as an aide-de-camp under King Stanislaus II. After many adventures he came home to England. Unable to secure promotion in the British Army, in 1769 he returned to Poland and saw action in the Russo-Turkish War. He lost two fingers in a duel in which he killed his opponent. Returning to England again, he found that he was sympathetic to the American colonists in their quarrel with Britain. He moved to the colonies in 1773 and in 1775 purchased an estate worth £3,000 in Berkeley County, near the home of his friend Horatio Gates. This area is now part of West Virginia. He spent ten months travelling through the colonies and acquainting himself with patriots. When war appeared inevitable he resigned his Royal commission and volunteered his services to the colonies. 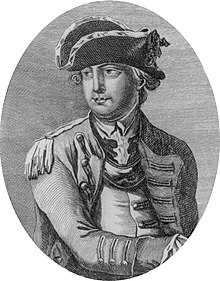 He expected to be named Commander-in-Chief of the Continental Army, as he was the most experienced candidate in terms of military service. On the other hand, he was born in Britain, somewhat eccentric, slovenly in appearance, coarse in language, and perhaps most of all, he wanted to be paid: by joining the rebellion, he forfeited all his properties in England, and wanted to be compensated. George Washington was sober, steady, calm, and best of all, would work without pay. Washington also was a good political choice: a southern commander to pair with a primarily New England fighting force. Washington received the appointment, and Lee was offered the subordinate rank of major general. Because of this, Lee had nothing but the utmost disdain for his superior. He once remarked, "Washington is not fit enough to command a Sergeant's Guard". Lee was often considered second in command of the Continental forces, although Artemas Ward, who was not in good health, officially held this position. During the encampment at Valley Forge in late 1777 and early 1778, Lee's headquarters was at the David Havard House. Lee also received various other titles: in 1776, he was named commander of the so-called Canadian Department, although he never got to serve in this capacity. He was appointed as the first commander of the Southern Department. He served in this post for six months, until he was recalled to the main army. During his time in the South, the British sent an expedition under Henry Clinton to recover Charleston, South Carolina. Lee oversaw the fortification of the city. Fort Sullivan was a fortification built out of palmetto logs, later named for commander Col. William Moultrie. Lee ordered the army to evacuate the fort because as he said it would only last thirty minutes and all soldiers would be killed. Governor John Rutledge forbade Moultrie to evacuate and the fort held. The spongy palmetto logs repelled the cannonball from the British ships. The assault on Sullivan's Island was driven off, and Clinton abandoned his attempts to capture the city. Although the credit of the defense was not Lee's, he was called "hero of Charleston". When Lee arrived in New York to join General Washington and the main part of the Continental Army, Washington chose to show his appreciation by changing the name of Fort Constitution, which was located on the New Jersey side of the Hudson opposite Fort Washington, to Fort Lee. General Lee was a very popular general officer among not only the army, but Congress. Toward the end of 1776, Lee's animosity for Washington began to show. During the retreat from forts Washington and Lee, he dawdled with his army, and intensified a letter campaign to convince various Congress members that he should replace Washington as Commander-in-Chief. Although his army was supposed to join that of Washington's in Pennsylvania, Lee set a very slow pace. On the night of December 12, Lee and a dozen of his guards inexplicably stopped for the night at White's Tavern in Basking Ridge, New Jersey, some three miles from his main army. The next morning, a British patrol of two dozen mounted soldiers found Lee writing letters in his dressing gown, and captured him. Among the members of the British patrol was Cornet Banastre Tarleton and William Harcourt, 3rd Earl Harcourt. Lee returned to service after he was exchanged for General Richard Prescott sixteen months later. During the Battle of Monmouth in June 1778, Washington needed a secondary commander to lead the frontal assault. He unwillingly chose to put Lee in charge, as he was the most senior of his generals. At first, Lee was so reluctant to take part in the attack that Washington bestowed command onto the Marquis de Lafayette. Upon this, Lee had a change of heart and requested that Lafayette cede command, which he gladly did. Washington ordered him to attack the retreating enemy, but instead, Lee ordered a retreat after only one volley of fire. After seeing this, Lafayette sent a messenger to Washington informing him of this behavior. Lee's troops retreated directly into Washington and his troops, who were advancing, and Washington dressed him down publicly. Lee responded with insubordination, for which he was arrested. Lee was found guilty, and he was relieved of command for a period of one year. In his Narrative, Joseph Plumb Martin recounted that Washington rode up during the retreat and asked Martin's officers "by whose order the troops [were] retreating". He was told that it was "by Gen. Lee's", and he said something that Martin was not close enough to hear. Martin was told later by those who had been close enough that Washington had said "damn him!" as he rode off, which Martin found unusual but plausible since Washington had been "in a great passion" because of the retreat. It is not clear that Lee had made a bad strategic decision; he believed himself outnumbered, which in fact he was – British commander Sir Henry Clinton had 10,000 troops to Lee's 5,440 – and believed that a retreat was reasonable. But he disobeyed orders, and he publicly expressed disrespect to his commander in chief. Washington had wanted to test the abilities of Lee's troops, since they were among the first to be trained in European tactics by Baron von Steuben. Some historians have suggested that Lee may have retreated at the Battle of Monmouth as part of a plan to aid the British. While Lee was being held prisoner by British General Sir William Howe, 5th Viscount Howe in March 1777, he drafted a plan for British military operations against the Americans. At the time, Lee was under a threat of being tried as a deserter from the British Army because he hadn't resigned his British commission as lieutenant-colonel until several days after he accepted an American commission. The plan in Lee's handwriting was found in the Howe family archives in 1857. Lee was very fond of dogs, and was seldom seen without half a dozen at his heels. Lee tried to get Congress to overturn the court-martial's verdict. When this failed, he made open attacks on Washington's character. Lee's popularity then plummeted. Colonel John Laurens, an aide to Washington, challenged him to a duel, in which Lee was wounded in his side. Lee was released from his duty on January 10, 1780. He retired to his Prato Rio property in the Shenandoah Valley, where he bred horses and dogs. While visiting Philadelphia, he was stricken with fever and died in a tavern on October 2, 1782. He was buried there in the churchyard of Christ Church. Lee left his property to his sister, Sidney Lee, who died unmarried in 1788. Fort Lee, New Jersey, on the west side of the Hudson River (across the water from Fort Washington, New York), was named for him during his life. Lee, Massachusetts; Lee, New Hampshire; and Leetown, West Virginia were also named for him. Lee was featured as one of the main antagonists in Assassin's Creed III, serving as second in command under Grand Master of the Knights Templar Haytham Kenway. He is killed by Connor Kenway. Lee and his arrest following the retreat during the Battle of Monmouth was depicted in the animated television series Liberty's Kids. Lee is a character in the 2014 AMC television series Turn: Washington's Spies, where he informs the British of a Continental Army patrol, which is then massacred by British-affiliated Rogers' Rangers. Next, Lee tells the British the location of a Continental Army safe house. British intelligence officer Major John André uses a honeypot to trap and arrest Lee at an inn in New Jersey, and he blackmails him to further help the British cause. Lee was portrayed by Brian T. Finney in Seasons 1 & 2. Lee is a character in Diana Gabaldon's novel Written in My Own Heart's Blood, part of the Outlander series. Lee, portrayed in the original Broadway cast by Jon Rua, is a minor character in the 2015 Broadway musical Hamilton, appearing in the songs "Stay Alive," and "Ten Duel Commandments." ^ John Lee served in 1st Foot Guards and 4th Foot. He was Colonel of 54th Foot and later 44th Foot. ^ a b c d e f g h i j k l m n o p q r s t u v w x y z aa ab ac ad ae af ag ah ai aj ak al am an ao ap Paul David Nelson (1999). "Lee, Charles". American National Biography. New York: Oxford University Press. ^ a b c d e f g h i j k l m n o p q r s t u v w x y z aa ab ac ad ae af ag ah ai aj ak al am an ao ap aq ar as at au av aw ax ay az ba bb bc bd be bf bg Henry Manners Chichester (1892). "Lee, Charles" . In Lee, Sidney. Dictionary of National Biography. 32. London: Smith, Elder & Co. pp. 344–7. John Fiske (1892). "Lee, Charles" . In Wilson, J. G.; Fiske, J. Appletons' Cyclopædia of American Biography. New York: D. Appleton. ^ a b J. L. Bell. "The Real Story of "Boiling Water"". Retrieved 2013-09-29. ^ Flexner, James Thomas (1979). Washington: The Indispensable Man. p. 120. ^ "National Historic Landmarks & National Register of Historic Places in Pennsylvania" (Searchable database). ARCH: Pennsylvania's Historic Architecture & Archaeology. Retrieved 2012-11-02. Note: This includes Pennsylvania Register of Historic Sites and Landmarks (January 1972). "National Register of Historic Places Inventory Nomination Form: David Havard House" (PDF). Archived from the original (PDF) on 2014-02-02. Retrieved 2012-11-03. ^ Gardiner. Life of Sir William Harcourt. Constable. p. 9. ^ "The Capture of Charles Lee". TURN to a historian. Retrieved 22 January 2015. ^ Stirling, Lord (1864). Proceedings of a general court-martial held at Brunswick...for the Trial of Major-General Lee. New York. ^ Lender, Mark Edward; Stone, Garry Wheeler (2016). Fatal Sunday: George Washington, the Monmouth Campaign, and the Politics of Battle. Norman: University of Oklahoma Press. pp. 268–269. ISBN 978-0-8061-5513-5. ^ Kenny, Hamill (1945). West Virginia Place Names: Their Origin and Meaning, Including the Nomenclature of the Streams and Mountains. Piedmont, WV: The Place Name Press. p. 366. ^ "Charles Lee". IGN. Ziff Davis, LLC. 2 December 2012. Retrieved 5 July 2018. ^ Dyce, Andrew (2012). "Assassin's Creed 3: Our 'Charles Lee Theory'". Game Rant. Warp 100 LLC. Retrieved 5 July 2018. ^ Hamilton, Kirk (12 November 2012). "Assassin's Creed III's Final Chase Sequence Was The Worst Thing I Played All Year". Kotaku. Gizmodo Media Group. Retrieved 5 July 2018. ^ "Battle of Monmouth". The American Revolutionfor Kids. 2 November 2012. Retrieved 5 July 2018. ^ "John André". AMC. AMC Network Entertainment LLC. 2014. Retrieved 2 March 2019. ^ Eyerly, Alan (21 April 2015). "'TURN: Washington's Spies' recap: Both sides step up covert activity". LA Times. Retrieved 2 March 2019. ^ Viagas, Robert (28 June 2016). "Jon Rua Will Play His Final Performance in Hamilton". Playbill. Retrieved 5 July 2018. ^ Mead, Rebecca (23 December 2015). "The Thrilling Uncertainty of the Understudy". The New Yorker. Condé Nast. Retrieved 5 July 2018. Allen, Thomas B. (2010). Tories: Fighting for the King in America's First Civil War. HarperCollins. p. 496. Axelrod, Alan. "The Real History of the American Revolution" Sterling Publishing, 2007. Karels, Carol (2007). "A Disobedient Servant". The Revolutionary War in Bergen County: The Times that Tried Men's Souls. The History Press. pp. 105–111. Mazzagetti, Dominick (2013). Charles Lee: Self Before Country. Rutgers University Press. ISBN 978-0-8135-6238-4. McBurney, Christian M. (2013). Kidnapping the enemy. The Special Operations to Capture Generals Charles Lee & Richard Prescott. Westholme Publishing. p. 234. ISBN 978-1594161834. Nelson, Paul David. "Lee, Charles (1732–1782)". American National Biography. Oxford University Press. (Subscription required (help)). Wikimedia Commons has media related to Charles Lee.